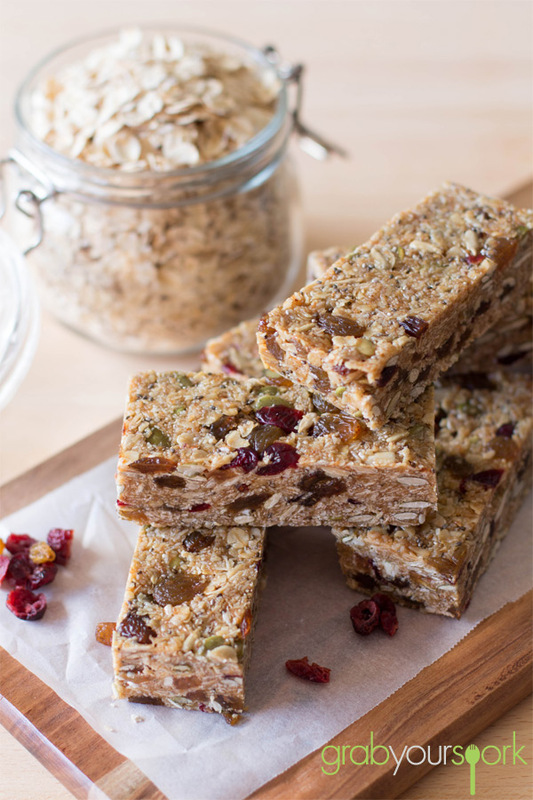 Muesli bars are a staple item for most. They are an easy energy snack to take with you to work, on a trip, before the gym or to pack in a school bag. For me they are still a regular mid-morning snack and it is so easy to just buy a box at the shops as they are individually wrapped and ready to go. The only downfall is this “healthy” snack isn’t always so healthy. 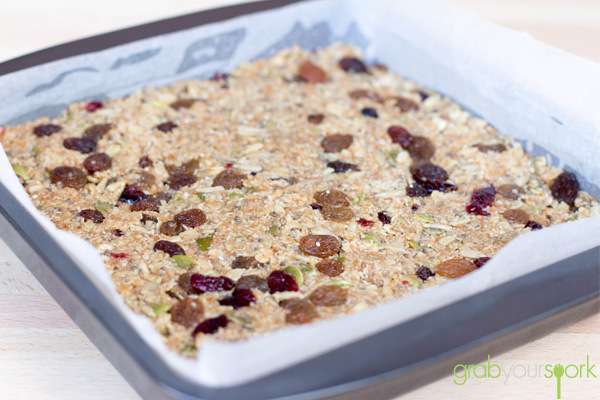 Typically processed muesli bars tend to contain a high level of butter, sugar and other added fats. 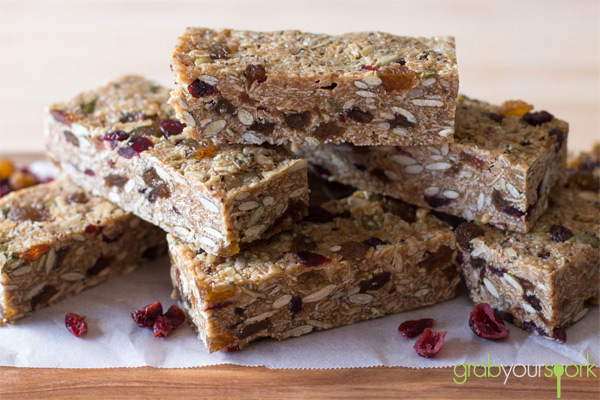 This recipe for homemade muesli bars is a quick and easy solution to the processed ones – and you don’t even need to turn on the oven! Now this recipe still contains butter, sugar and honey to bind the dry ingredients, but given the amount of slice you make it will be far less than any sugar contained in the store bought ones. The ingredients we used are very versatile and can be swapped out for your own preferences. 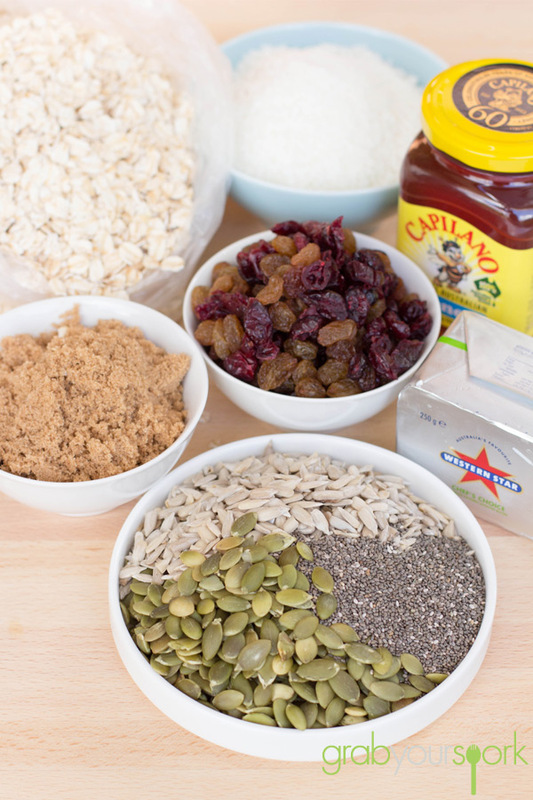 However we used a combination of rolled oats, desiccated coconut, dried sultanas and cranberries, pepitas (pumpkin seeds), sunflower seeds and chia seeds. As you don’t bake the bars, simply toast all the dry ingredients till you have a nice golden colour on the oats and coconut. In the meantime melt the butter with some brown sugar and honey till it is almost like caramel. 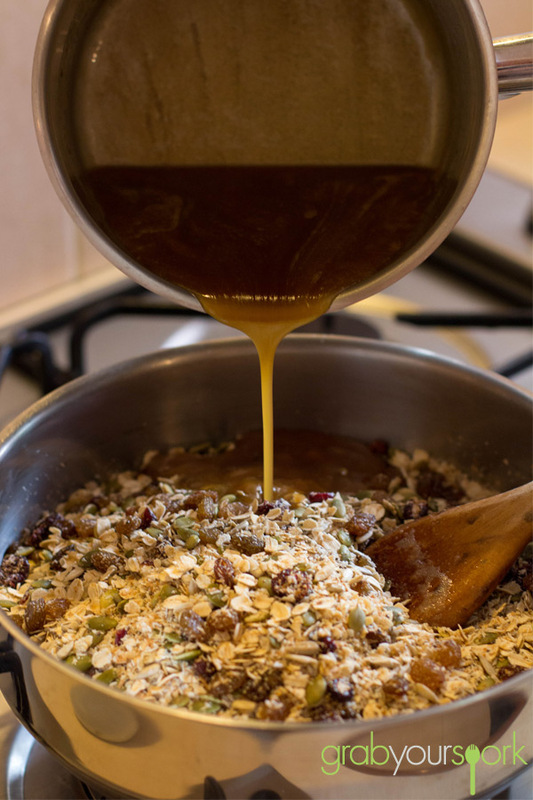 Once the caramel mixture has cooled pour this onto the dry ingredients mixing well. When putting the mixture in the tin ensure you use a metal spoon to compact the mixture firmly in the tray. Allow to completely cool. Once the slice has cooled, the slice will be firm and ready to cut into bars or squares. You can keep the bars in an airtight container for a week or as long as it lasts! Homemade Muesli Bars made with a combination of rolled oats, desiccated coconut, dried sultanas and cranberries, pepitas (pumpkin seeds), sunflower seeds and chia seeds. Grease and line a 20cm square baking pan with baking paper. 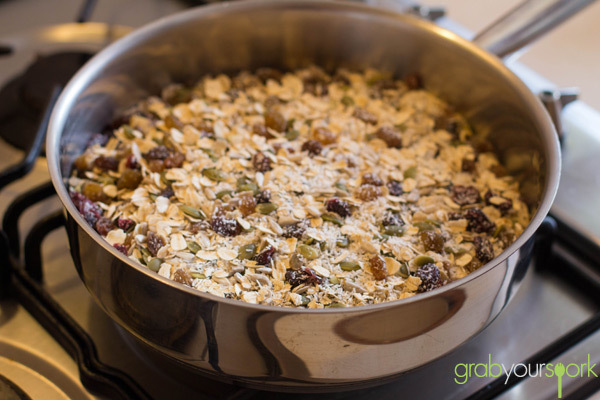 Add oats, coconut, sultanas, cranberries, pepitas, sunflower seeds and chia to a non stick frying pan over a medium heat, stirring for 5 – 8 minutes or until golden. In a small pot cook butter, honey and sugar over a medium heat, stirring for 4 – 5 minutes until sugar dissolves. Bring to the boil. Reduce to a low heat and allow to simmer for 1 – 2 minutes. 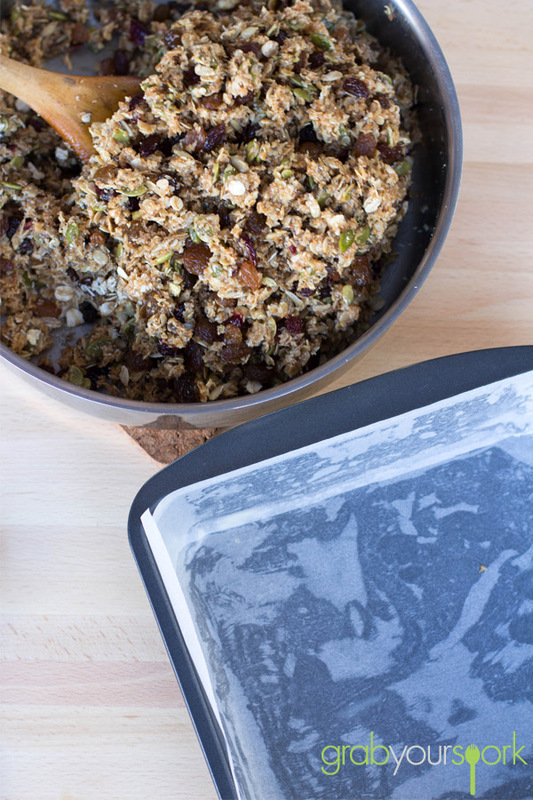 Allow to cool slightly before pouring over dried ingredients. Stir until well combined. Spoon the mixture into the pan. Using a metal spoon press the mixture down firmly. Allow to cool and cut into squares or bars.